I spent Sunday night and Monday AD-ing for the fantabulous Mr. Cullman at The 24 Hour Musicals on Broadway. #24HM is the Twitter tag – check it out to see tweets from yours truly as well as many others. It was a fast-paced, wild ride that resulted in 4 very awesome, very imaginative, very engaging ten-minute musicals. 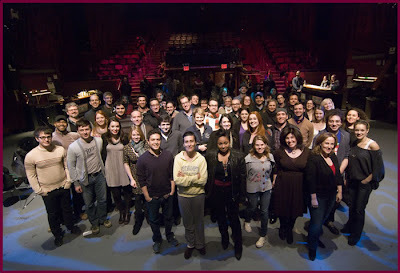 Below is an all company photo, taken Sunday night just as the madness was kicking off. Click here for more info and photos from the event.